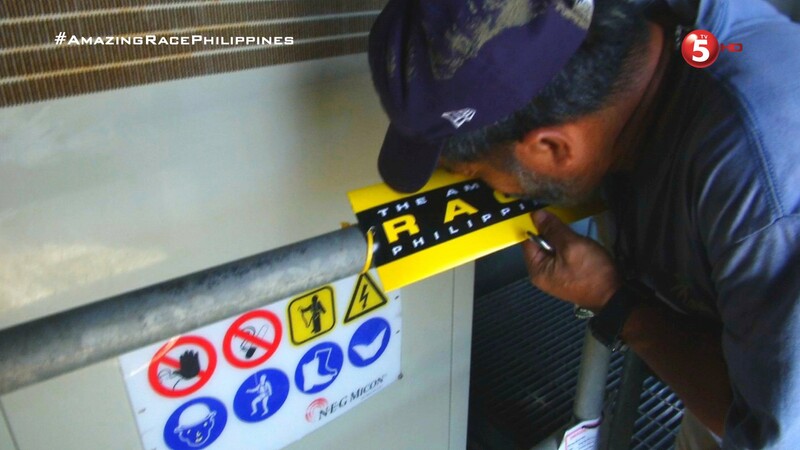 Recap: The Amazing Race Philippines 2, Episode 26 (Leg 5, Day 2) – "Hindi ako pinanganak para sumuko." 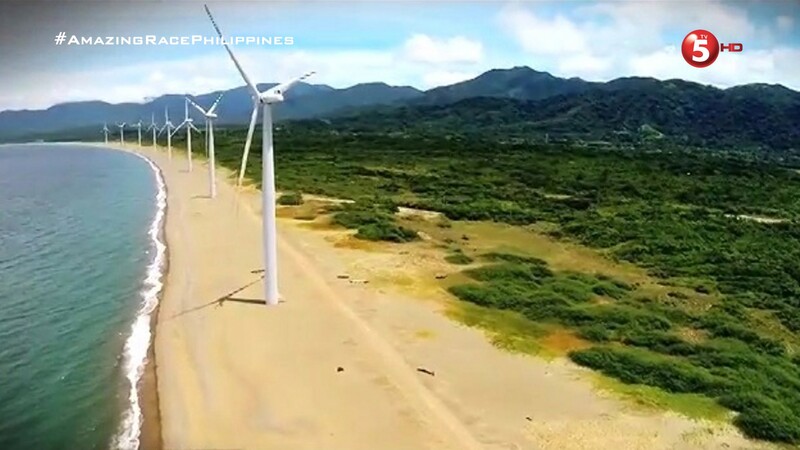 Teams are now on their way to the north’s most iconic landmark, the Bangui Windmills in Ilocos Norte. At the Bangui Wind Farm, teams will find the Road Block. 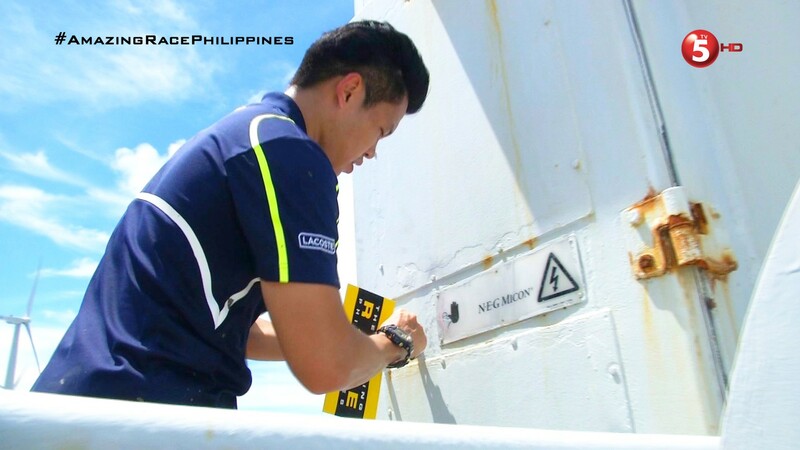 For this Road Block, teams will choose a key that they will need to use to open the door to one of the 14 wind turbines and retrieve their next clue inside. But before teams can start the Road Block, they must check-in at the Must Vote board. Matt & Phoebe arrive first and they vote for Jet & Yna. Matt decides to do the Road Block. Phoebe is happy because she thinks she’d just fail at this task. AJ & Jody speed past Jet & Yna and arrive at the windmills 2nd. Because Jody has done the last three Road Blocks, they need AJ to do this one. Jet & Yna are close behind and Jet decides to do it. Yna doesn’t think she can. Both teams vote for Matt & Phoebe. The long distance teams need to run to reach each windmill is nothing for Jet who runs marathons around the world. He’s also excited about being here at the windmills, on The Amazing Race. Yna and Phoebe cannot believe Jody forced his father to suffer through this difficult Road Block. They think this task is too tough for AJ to complete. Matt gives AJ some water when they run into each other walking from windmill to windmill. Meanwhile, Kelvin & JP are excited to be going to the windmills. And RR & Jeck are frustrated that no one is pointing them in the right direction to the, what they are surprised to find out, very far Bangui. Vince & Ed arrive and Ed decides to do it. Roch & Eji are close behind and Roch is happy seeing the huge windmills up close. Eji does the Road Block. Both teams also vote for Matt & Phoebe. AJ crosses a deep spot on the beach where he has to walk through the water and the next windmill he checks is the correct one. AJ & Jody are now in first place heading to the next Route Marker at the Kapurpurawan Rock formation. Matt is close behind when he opens the lock on his 14th windmill. 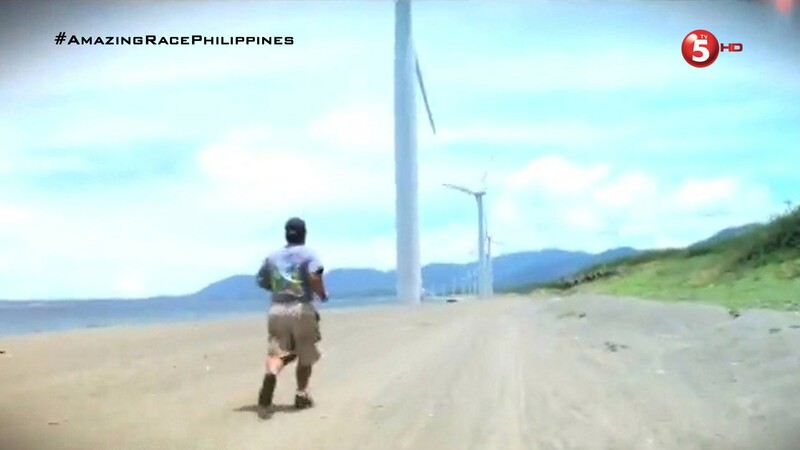 Jet has wanted to run at the Bangui windmills for a long time, so he appreciates this opportunity. And just then, he finally opens the correct windmill and he and Yna leave in 3rd. They run into RR & Jeck on the road and they tell them about this being a running and luck challenge. RR & Jeck are not excited. Ed finally opens a windmill and he and Vince leave just as RR & Jeck arrive. They vote for Matt & Phoebe and Jeck decides to do the Road Block. Kelvin & JP finally arrive and JP decides to do the Road Block after also voting for Matt & Phoebe. Kelvin decides to hug RR and Roch in the waiting area. RR decides to order some bulalo to eat. After enjoying lunch, she messes with Eji a little who is still trying to find the right windmill. Roch tells RR about telling Eji about RR asking whether he’s gay or not. RR says she’s got great gaydar. Eji finally finds the right windmill and he and Roch are off with some shrieks. Roch is happy Eji wasn’t annoyed with her. RR decides to take a nap and tells Kelvin to let her know when Jeck gets the clue. But it is JP who gets the clue first and he and Kelvin are finally out of last place for the first time in a long time. RR wakes up to find herself alone and is now worried about Jeck needing to stay out in the sun this whole time. They leave the windmills in last. But this was more of a physical task than a luck task. And I am definitely hoping for more physical tasks. It was great to see another location I’ve been to featured on a TAR again. The Bangui windmills are breathtaking up close. Definitely worth a visit up north. But I’m also pleasantly surprised they are continuing north to the Kapurpurawan Rock formation. I thought they’d head back down to Paoay now (as shown by the trailer and previews, the teams will visit Paoay Church and the sand dunes). Lots of driving this Leg. What amuses me is these are all locations on the opening leg of TARPH: DryedMangoez edition. lol The only locations missing are the Marcoses’ Malacanang of the North and the zipline at Hannah’s Resort. Hehe. This episode though also had some great editing. We got some great team interaction, that fun “binocular” shot of Jeck, that overdramatic reveal at the end between JP and Jeck; maybe most interestingly edited episode yet. I was a little annoyed though by the other teams making a big deal about AJ doing the Road Block. Again, people older than him (and older than THEM!) have done much more difficult tasks on The Amazing Race than this. And besides, do they not understand how Road Blocks work? They aren’t supposed to know what the task is before choosing who’ll do it. And they must remember Road Block counts as well. But anyway, the task itself was good. Location amazing. This Ilocos Leg is off to a great start. 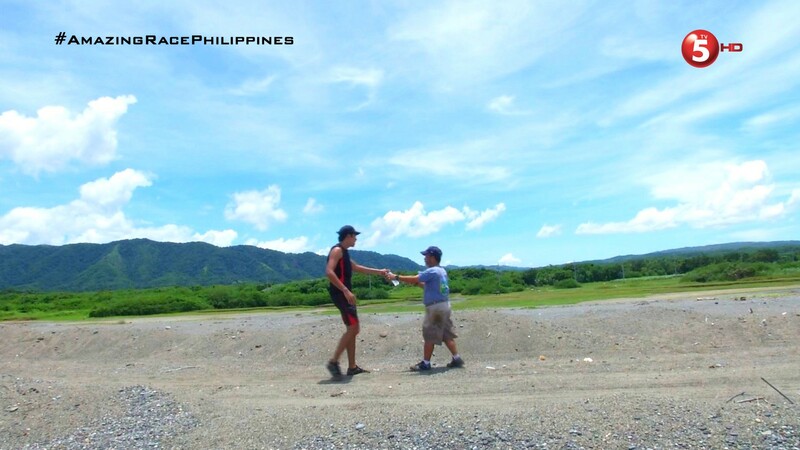 ← Recap: The Amazing Race Philippines 2, Episode 25 (Leg 5, Day 1) – "Puro putik ang buong katawan ko!" backlinks to rank in top10. I know – buying them is too expensive.